Now that my kids are entering elementary school, they are invited to A LOT and I mean A LOT of birthday parties. Recently, a friend left a comment on my post regarding how attending birthday party's often requires a big hit to the wallet. I agree. After Christmas, Target had a huge sale on toys, so I decided to stock up. My new rule is that I won't spend more than $10 on a birthday gift. Or I should say, I can't spend more than that because I just don't have the budget for it. I bought lego sets, mp3 players, Star Wars puzzles (Almost all boy stuff. I try to make the girl gifts!)... I put them on a shelf in the laundry room and my kids get to "shop" there and pick a present for their friend. In last Sunday's paper, there was an insert of coupons for Hasbro games and toys. I took the coupons to Target, but even with the coupons, the toys were too expensive. 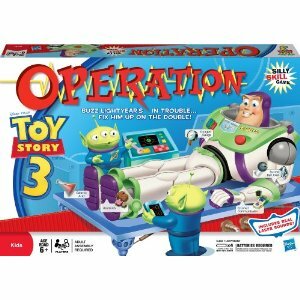 On Tuesday or Wednesday, I noticed on Money Saving Mom that Toy Story 3 Operation was TWO dollars at WalMart with a coupon. At Target, this game was $16.00. At Walmart, it was priced at $5.00. Use the three dollar coupon and it's only TWO bucks! I bought a couple. You also get a free Tombstone pizza via rebate for each game (there is a tear pad right by the games) so I got 2 games and 2 pizzas for $4 total. Not too shabby! Don't get the Sunday paper? Never fear! 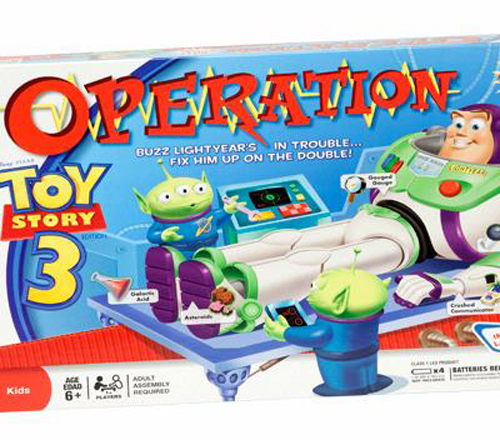 Click here for the Hasbro printable coupons! Have any fab finds? Ideas on how to save money on gifts? Comment on my blog and share them with us! A Toy Story Operation game? How cute! I saved on girls' gifts by hitting Claire's. They often have $10 for 10 items on clearance, and you can put together one or two really nice gift bags with all the findings, whether for little girls or big girls. You can even find cute little purses or bags for $1 and put the little things inside.